Input text: The second car is -3 feet above and -1 feet in front of a first car. It is leaning 20 degrees to the back. The third car is -2.5 feet above and -4 feet in front of the second car. It is leaning 60 degrees to the back. 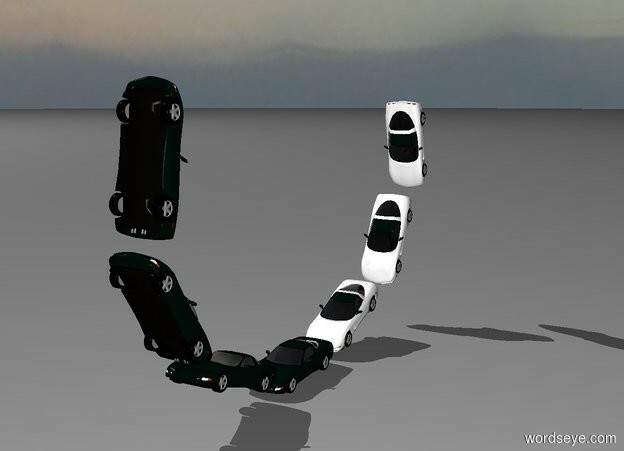 The fourth car is -1 feet above and -9 feet in front of the third car. It is leaning 100 degrees to the back. The first white car is behind the first car. It is leaning 20 degrees to the front. A second white car is 3 foot behind and -4 feet above the first car. It is leaning 60 degrees to the front. The third white car is -1 feet above and -1 foot behind the second car. It is leaning 100 degrees to the front.